The Juno Beach Centre is publishing here a seven-part series that tells the story of the Last Flight of the Whitley AD-701, researched and written by Shirley Stone. On March 21, 1944, F/O David Webster Goodwin (Penticton/Kaleden, British Columbia); Sgt. Wilfred Gordon Harris (Grand Valley, Ontario); Sgt. 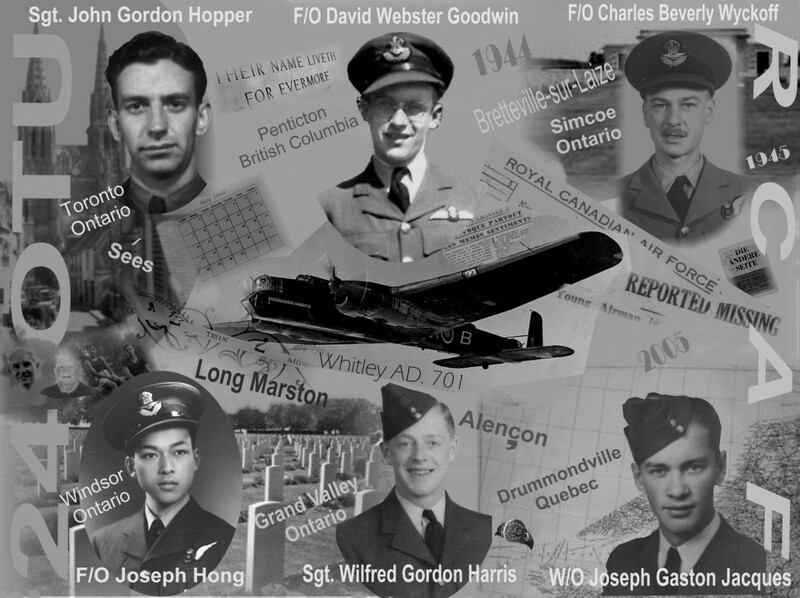 John Gordon Hopper (Toronto, Ontario); W/O Joseph Gaston Jacques (Drummondville, Quebec) and F/O Charles Beverly Wyckoff (Simcoe, Ontario), serving with the Royal Canadian Air Force arrived at 24 OTU (Operation Training Unit) in Honeybourne, Worcestershire, not far from Stratford-upon-Avon. F/O Joseph Hong (Windsor, Ontario) arrived at Honeybourne on April 4, 1944. They had completed various training courses in Canada and in England and were to begin training to operate the Whitley V bomber. Shortly after their arrival at the 24 O.T.U. the six Canadians came together to form a crew. After the crew had formed, the six men were sent on daylight cross-country flights, usually taking about five hours. The next step was night circuits, followed by night cross-country trips. At the end of the O.T.U. training (usually 6-8 weeks) was a ‘graduation exercise’. Before being assigned to squadrons, a crew would be sent on a ‘Nickel Sortie’, which was the code name for a leaflet-dropping mission, their first operation over enemy held territory. On the night of May 22, 1944, six Whitleys from the 24 O.T.U. left on ‘Nickel Sorties’ (leaflet drops). The targets in France were Alençon, Laval and Le Mans. The six men aboard Whitley V AD 701 (TY-B) took their pre-flight briefing at 1600 hrs. at R.A.F. Long Marston, Warwickshire (approximately 5 miles from RAF Honeybourne). The final briefing occurred at 1900 hrs. and at 2148 hrs. the flight departed. When the crew had not returned to base at the assigned hour, they were reported as missing in action. It was much later when the authorities learned Whitley AD-701 had been shot down by enemy flak and crashed in a field at La Potence, near Sées, Normandy. All aboard were killed. Their bodies were buried in the communal cemetery in Sées and, at the end of the war, were exhumed and re-interred at Bretteville-sur-Laize Canadian War Cemetery, Cintheaux, France. They are buried in joint graves 27.G.4-7. Found at the crash site by French Gendarmes were a photo and a gold signet ring. It was not until 2004 when it was learned the identity of the six Canadians who lost their lives on May 22, 1944. Roger Cornevin and his brother had witnessed the crash as well as Gérard Malherbe, all residents of Sées. Roger, after several years, was able to learn the names of those who died after he contacted the Air Ministry in England. He took his story to the newspaper in Sées and articles were written, asking for anyone who had information to make contact. Gérard Malherbe came forward with a photo of an unidentified photo of an airman and Georges Buvron, whose father who was the Gendarme who investigated the crash, came forward with a gold signet ring (pictured below). On the ring ‘Grand Valley, CAS’ was engraved and on the inside of the ring were the initials, ‘WGH’. Several months later, it was learned it was a photo was of F/O David Webster Goodwin, and the owner of the gold ring was Sgt. Wilfred Gordon Harris. The town of Grand Valley had presented the rings to all servicemen from the town before they went overseas. The Town of Sées erected a marble monument to honour the six Canadian airmen. Family members and friends were invited to attend the ceremonies which were held on May 8, 2005, the 60th anniversary of VE-Day. The day before the ceremonies a bus tour was arranged to visit Juno Beach Centre and, on the way back to Sées, the bus stopped at the memorial so the family members could see it privately. When the bus neared the memorial, there was a field of yellow colza, with a flagpole and Canadian flag marking the crash site and a bagpiper stood at the monument, playing a lament.